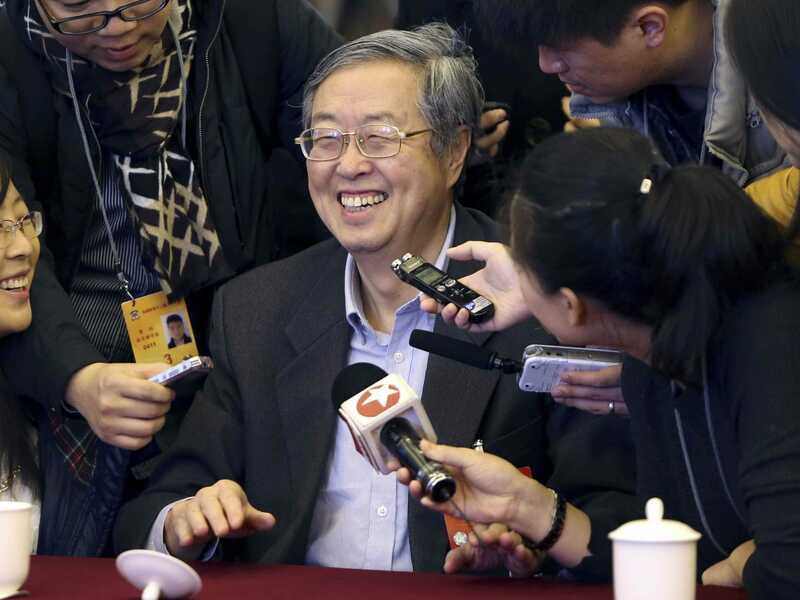 REUTERS/StringerChina’s central bank governor Zhou Xiaochuan is surrounded by journalists. Good morning! Here are 10 major events you should know about before US stock markets open. Markets Are Ripping Higher. Global stocks are up following dovish actions from the European Central Bank and the People’s Bank of China. Dow futures are up 110 points, and S&P futures are up 12 points. In Europe, France’s CAC is up 1.7%, Germany’s DAX is up 1.8%, and Spain’s IBEX is up 2.1%. t is essential to bring back inflation to target and without delay,” Draghi said. “We have to be very watchful that low inflation does not start percolating through the economy in ways that further worsen the economic situation.” Draghi said the ECB would broaden its asset-purchase program to address these problems. The euro tanked on the news and is down by 0.9% against the US dollar. The PBoC Cuts Rates For The First Time In 2 Years. At about 5:30 a.m. ET, the PBoC cut rates for the first time since July 2012. The one-year deposit rate got cut 0.25 points to 2.75%, and the refinancing rate was slashed 0.40 points to 3.60%. These moves come as data continues to show deceleration in the world’s second-largest economy. Obama’s Immigration Announcement Could Lead To A Shutdown. US President Barack Obama unveiled his executive order that will shield about 4 million undocumented immigrants from deportation in a prime time address from the White House on Thursday evening. Top Republicans responded by hinting they could push the government toward another shutdown. UKIP Won Another Seat In Parliament. With 42% of the vote to the Conservative party’s 35%, Mark Reckless is now the anti-EU party’s second member of parliament. Alibaba Raised $US8 Billion In A Massive Bond Sale. The Chinese e-commerce giant Alibaba raised $US8 billion in a bond offering, The Wall Street Journal said. Japanese Prime Minister Shinzo Abe’s Support Is Tumbling. Support for Japanese Prime Minister Shinzo Abe is at its lowest since he took office, and more than a third of voters think his economic policies have failed, a survey Friday showed. Blackstone Is Buying $US1.6 Billion (£1.02 Billion) Of Real Estate From GE. The US private equity firm Blackstone said it would buy the residential real estate arm of General Electric’s property unit in Japan, as the country’s land prices slowly recover from an asset bubble burst. The Fed Is Reviewing Its Relationship With Big Banks. According to the Financial Times, the Federal Reserve will conduct a review of its position as regulator of large financial institutions. Foxconn Is Building Another Factory Just For Apple Displays. The factory will be located in southern Taiwan and follows an “urgent request” from Apple, according to a Foxconn spokesperson quoted by Bloomberg.